Switch off the parking lamps and lowbeam headlamps when you leave the vehicle. This prevents the battery from discharging. If you hear a warning tone when you leave the vehicle, the lights may still be switched on. ► Turn the light switch to . The turn signals, high-beam headlamps and the high-beam flasher are operated using the combination switch . • remove the SmartKey from the ignition lock • open the driver's door with the SmartKey in position 0.
turn the SmartKey in the ignition lock to position 2 or start the engine. The daytime running lamps function is required by law in Canada. It cannot therefore be deactivated. With the engine running: depending on the ambient light, the daytime running lamps or the low-beam headlamps are switched on. the instrument cluster lights up. When the engine is running and the vehicle is stationary: if you move the selector lever from a drive position to P, the daytime running lamps/low-beam headlamps go out after three minutes. precedence over the daytime running lamps. In the USA, the daytime running lamps are deactivated upon delivery from the factory. : activate the daytime running lamps function in the on-board computer . take precedence over the daytime running lamps. The automatic headlamp feature is only an aid. The driver is responsible for the vehicle's lighting at all times. turn the light switch to . 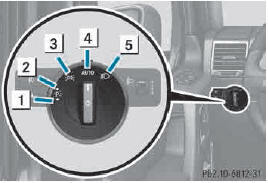 SmartKey in position 1 in the ignition lock: the parking lamps are switched on or off automatically depending on the brightness of the ambient light. With the engine running: if you have activated the daytime running lamps function in the on-board computer, the daytime running lamps or the low-beam headlamps are switched on or off automatically depending on the brightness of the ambient light. before you start your journey. Your vehicle may otherwise not be visible and you could endanger yourself and others. 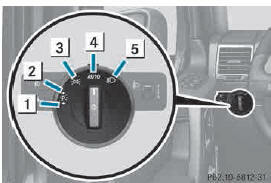 ► To switch on the fog lamps: turn the SmartKey in the ignition lock to position 2 or start the engine. 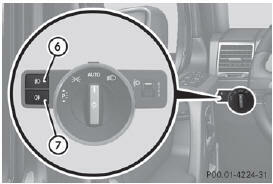 ► To switch off the front fog lamps: press the button. Only vehicles with front fog lamps have the fog lamps function.